Designed for severe hearing loss, low vision, or limited mobility. Powerfully amplifies incoming sound up to 50+dB louder. High-Definition Sound and Digital Tone Control technology for enhanced clarity. DECT 6.0 technology for superior range and interference-free calls. Talking Caller ID and large, lighted keys “talk” in English or French. Eight one-touch speed-dial buttons and easy-to-use phone book. Hearing aid-compatible handset and accessory jack. Powerful amplifier increases incoming sound up to 50dB louder. High-Definition Sound (HDS) technology makes every word crisp and clear. Digital Tone Control enhances voice frequency and makes difficult-to-hear words easy to understand. Talking Caller ID with Call Waiting* announces the caller's number before answering, in English or French. Large, light keys "talk-back" in English or French to confirm the pressed number. One-touch Help button for hands-free emergency calls. Bright visual ring flasher and super-loud ringer on handset and base. Battery backup for full operation during power outage (Battery not included). Output jack for tele-coil, neck-loop, and other assistive accessories for hearing aid & cochlear implant users. Q: There is no response when I press any key; what do I do? A: Verify you are using RECHARGEABLE batteries. Take out the batteries for a few seconds and re-insert. Verify no keys are jammed. Q: No dial tone/can not make a call. 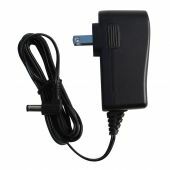 A1: Check the AC adapter and the phone cord connection (refer to page 9 of the user’s manual). A2: Make sure you are not too far from the base. A3: Check the phone cord by replacing it with a cord from another phone that is in working order. A4: Press the “TALK” button and verify if the online indicator light is on. The base should light up if the “TALK” button is pressed on the handset (if the base does not light up, the handset and the base will need to be registered together). A5: If this is a new handset, verify that the batteries are charged and installed correctly in the battery compartment. Remember; you must register it to the base before using. To register: Press and hold the “PAGE” button on the base for six seconds; a confirmation tone should sound. Then press and hold the “PAGE” button on the handset for six seconds. Base and handset should register. Q: The phone rings but does not speak the incoming number. A: In the battery compartment, slide the bottom switch to the left. Press the number buttons on the keypad to see if it announces the numbers. Q: The phone refuses to register. A: The base's memory must be wiped out. To restore, press and hold the PAGE button on the base until it does one long beep and one short beep, quickly press the base PAGE button seven more times and wait. The base flasher will begin flashing faster indicating that it has deleted the memory. This will now allow you to register normally. Q: How do I change from Pulse dialing to Tone dialing? A: Hold the star key down for 6 seconds. Q: Can make calls but cannot retrieve voicemail or open front gate. What do I do? A: Press all keys on the keypad and confirm there is a tone for each key. If there is only a click sound this means pulse dialing is active, refer to the previous question to turn off pulse dialing. A: Press the “AMP” key for extra amplification. Adjust tone controls to get the best voice clarity. Recharge handset if the battery icon shows that the battery is low. Q: I cannot program one-touch memories. A: Programming must be done while the phone is off-line. Enter the number and press and hold memory key for five seconds to save. Q: There is too much static noise in the receiver. A1: If you have a DSL computer modem service, make sure you have installed a DSL filter to block the DSL noise. DSL filters can be purchased at RadioShack, Best Buy, Walmart and other retail outlet stores with telephone products. You may also get the DSL filters FREE from your phone company/DSL Provider. A2: Your phone may be located near a touch lamp, microwave, or other appliance. A: You are in speaker mode. Press “TALK” to disable speaker mode. Q: Can I turn off the talking keypad but keep the talking CID? A: No, unfortunately on the model CL65 the talking keypad is tied into the CID. The #2 switch on the handset's battery compartment must be switched to "ON" in order for the CID feature to function. Q: Can I put alkaline batteries (non-rechargeable) in the base or handset? A: No! The use of non-rechargeable batteries can cause battery leakage and will void your battery warranty! Q: What if I do not install backup batteries in the base? A: We strongly suggest that you do, your phone will be 100% operational, even when there is a power outage. Make sure to use RECHARGEABLE batteries. Q: How should I dispose of any used batteries? A: Do not dispose of used batteries in the trash. Always recycle used batteries through the local community recycling center. Q: My phone only rings 2 times; can I change the number of rings on my phone? A: It will continue to ring if you do not have an answering service from your telephone provider. If you do have the answering service, you can control the number of rings through your phone. Q: My phone beeps every 6 minutes. A1: This alerts the user on a few things: the presence of a voice mail, the handset battery is running low, or even that you are out of range. A2: Press and hold the Flash key for 6 seconds. Q: Can I change the melody on the phone? A: Yes. Push the Tone Down button then select the melody by pushing the volume key on the side of the handset up. This will cycle through the melodies. When you find the melody you want, push and hold the Tone Down button for 4 seconds and hear a beep to confirm. Q: How long will the backup battery work? A: It will give you up to 4 hours of continuous talk time. Q: The red speed dial button goes automatically to speakerphone. Can I change it? A: No. The first red speed dial button is designed to be used for emergency calls. The speaker function is very helpful if someone is hurt or having a difficult time. Q: How can I turn off the "talking" voice or “talking” keypad? A: Open the battery compartment and set the "talking" selection switch to off (2nd slide switch). Q: Can I change the voice level of the talking caller ID? Q: What if I want the amplifier on every time I use the phone? A: Open the battery compartment and set the Auto-Amplifier switch to the ON position (top slide switch). Q: What if the incoming voice is too loud for my family members? A: Set the Auto-Amplifier in the battery compartment to Off (top switch to the right). Whenever the amplify feature is needed, press the AMP button on the front keypad. Q: What if I wear T-coil hearing aids? A: Turn on the T-coil in your hearing aids and speak normally. If not, your phone will not be operational, in case of a power outage. Q: How do I activate the speaker? A: Press the “TALK” button once if you are already on the line, twice if you are not on the line. Press “TALK” again to turn it off. Q: The base charging indicator light is not on when the handset is placed on the base. A: Move the handset slightly to make better contact with the charger. Q: When I press any key, the handset just beeps and there is no dial tone. A: The handset probably lost sync with the base. 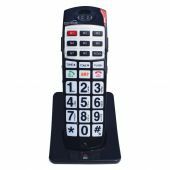 Press and hold the END key for 5 seconds to turn off the handset power, and then repeat to turn back on the power. They should sync up in about 5 – 30 seconds. Q: How do I erase a phone number from a speed dial button? A: Hold the particular speed button down for 6 seconds until you hear a beep (handset only). Q: Why doesn't the base ring when the handset is on the base? A1: When the handset is on the base, only the handset will ring. A2: If your handset is not ringing either, check to see if your handset is in Do Not Disturb Mode or if the volume is low when ringing. Q: The light on my handset keeps blinking, but I don’t have a message. A: The light blinks when you have a voicemail waiting in your telephone provider's mail server or missed call. Hit Talk and then End, this will turn the light off. Q: Phone is no longer announcing the incoming call. A: Make sure the lower left switch in the battery compartment is set to ON. Q: How do I reset the phone to factory settings? A: Hold the page button down on the base for about 5 seconds until you hear a beep. Then push the page button down 7 times. This will reset your phone. Q: The phone is ringing very low and I can hardly hear it. A1: Have someone call your phone, while it’s ringing, push the volume up button on the side of the phone about 5 times in a row. A2: Press the TONE UP - will make the ringer louder - press it and press the volume button on the side of the handset up to adjust your ringer. Then press and hold the TONE UP button until you hear a beep to confirm the changes have been saved. A: If you press the talk button first, then dial, you will not hear the numbers you are dialing. You have to press the numbers before pressing the talk button in order to hear the numbers. Q: Handset flasher works but the handset does not ring. A: Verify your handset is not in Do Not Disturb Mode. To deactivate Do Not Disturb Mode, press and hold # for six seconds. Q: How do I delete a memory number from a one-touch memory? A: Hold down the memory key you want to delete until you hear 1 beep.